We're going STRONG this January with some amazing artists! This week we're highlighting MM fave, Krislam Chin: Graphic Designer, Hand Lettering Artist and most importantly in our book-- Waffle Enthusiast. We love having Krislam in our studio teaching her workshops and are so excited for you to learn more about her! Krislam Chin is a Senior Graphic Designer based in Downtown Los Angeles. After studying branding at FIDM, she embarked on her journey to revolutionize the creative industry in 2011. She began her career in market research, transforming quantitative and qualitative reporting through creative data visualization and imaginative infographic design for clients such as American Girl, Disney, Fisher-Price, CNN, Direct TV, Starbucks and Saatchi & Saatchi. he was formerly the Sr. Graphic Designer of Internal Communications at TechStyle Fashion Group (formerly JustFab), where she oversaw the creative direction for global corporate communications and elevated internal branding through innovation and strategic design. 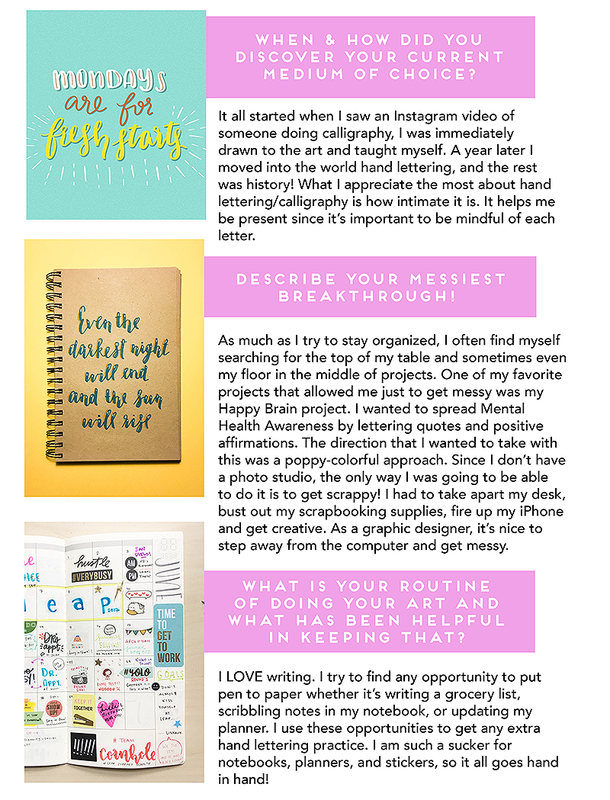 When she’s not working, Krislam spends her time hand lettering, geeking out over the newest design trends with her man (who’s also a designer), or play with her dogs, Geoffrey and Alfred. She’s a waffle enthusiast, coffee snob, and hopeless Grey’s Anatomy fan. SIGN UP FOR KRISLAM'S WORKSHOP THIS SATURDAY!